he Duofold is the pen that actually made the Parker Company one of the greatest pen-manufacturers of the world. Until the Duofold few pens were made of anything but black rubber. Parker found a method to make the rubber in a red-orange colour, and when the pens began to sell they really sold. The Duofolds had their world premier in early 1921. Marketing the red Duofolds was something of a risky venture since Parker previously, in the early 1900's, had tried marketing a red pen, the Red Giant, wich was disastrous. Especially the cap proved very brittle and the guarantee became very expensive. The production came to an abrupt halt. hile the Parker Lucky Curve pens were selling well, there was nothing special about them to catch the publics eye. In the early 1920's a district sales Manager, Lewis M Tebbel, persuaded a machinist at the Parker plant to make him a a Lucky Curve model #26 in some old stock red hard rubber. Tebble used the standard black rubber for the section and clip screw, which gave the prototype a stunning appearence. Tebbel returned tohis district, Spokane, with the pen and some local dealers were so impressed with it that they prompted him to ask the factory for a dozen. This was initially refused but when Tebble insisted, he was granted the dozen. oon thereafter Tebbel made another order for even more red pens. He now proposed to Parker that they should incorporate the "Duofold", as he called the new pen, in the regular line, selling it for $7. He was refused by the Parker management t still wasn't ready to roll over. Instead he contacted Kenneth Parker directly. He had just returned from an intership at an advertising agency and was eager to try the power of advertising. 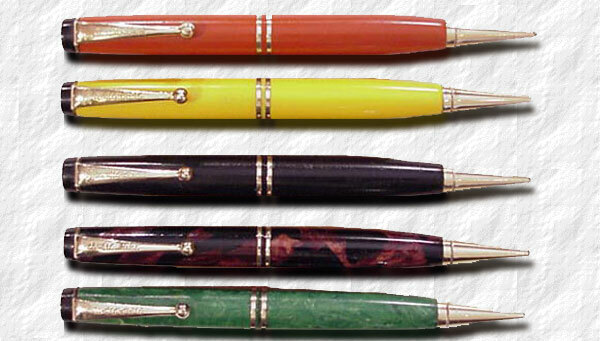 t took a great deal of persuation and negociation but in august 1921 the first pens was in production. There were a few pens made with a lower concentrate of red pigment, making them more brown than red, but these were never sold. Collectors traditionally refer to the colour of the first Duofolds as Pompeiian Brown. This was however not a colour any different from the later models, but only refers to old advertisment which used the phrase to descriibe the colour in papers printed in black and white. They also wanted to avoid "red" which still could reminicent of the Red Giant débâcle. The first Duofolds was, save the colour, identical in size and appearence to the Lucky Curve #26 and came in one size only, later referred to as the Senior Duofold. (app 139 mm Long 16 mm Wide) and only in Red. Very quickly this unusually large pen was nicknamed "Big Red", a name that still survives among collectors. A bandless Senior in red, a Senior in non-production Pompeiian Brown, a Senior in Mandarin Yellow, a Senior in Lapis Lazuli Blue with white specks, a Senior in transparent bakelite, a Junior in experimental Bronze and Gold, A Senior DeLuxe in Moderne Green and Pearl, a Senior Imperial or DeLuxe in Moderne Black and Pearl, a Senior in Burgundy and Black, a Senior DeLuxe in Moderne Pearl Green and Black aka Sea Green Pearl, a Senior in experimental Pearl Blue and Black. Three English Valentines: Lined Green Silver and Burgundy, Lined Rose Silver and Burgundy, Lined Cream Silver and Brown. A Vest Pocket Duofold in experimental Blue with Green swirls and finally a Vest Pocket in experimental Waterflow Blue. A stunning collection. A 1922 bandless Duofold Senior in red hard rubber with the Giant imprint. A 1923 broad banded Duofold De Luxe in red hard rubber with the Giant imprint. The Lucky Curve part being inside a small banner. The first year-Duofolds also had the additional cap engraving of the earlier Jack Knife Safety pens. n 1922 two smaller pens were added to the line, the Junior and the Lady Duofold. The Junior was just a shorter version of the Senior , while the Lady came in a few length and width variations and with either a clip or ring top or no clip at all. Soon the Lady design was set, being of the same length as the Junior, but more slender, and having a ring top, rather than a clip. They still didn't have any cap bands. The same year, the christmas season closing in, the Duofold De Luxe-line was introduced. These had a very wide (app 15 millimeter) gold band covering the cap lip. A long, rare version of the Lady pen has also surfaced, very similiar to the later long Special pens, but with the De Luxe broad cap band. The De Luxe came with either 14K solid gold or 12K gold filled bands. y 1922 Parker still offered more that 150 different models of pens and it was suggested that the Duofold should also be offered in the colour black. So in 1923 the black, bandless Duofold was introduced. Models were offered in both plain and chased finishes. n february the Duofold was also offered with an optional gold girdle, a cap band. This feature initially cost extra, no doubt a strategy to allow the cleaning out of old stock. By november there was no extra charge for the cap band. During this period Parker also retro fitted cap bands on already sold pens. The first gold girdles didn't fit flush but was a bit raised from the surface. The same year a pencil was introduced top the line. These first year pencils had the clip protruding from the crown, rather from under it, as on the later pencils. Although the Lady, with it's wide cap band, had more in common with the De Luxe line, it was however promoted as a "standard" Duofold. There was also an un-catalogued pen called the Long Junior, or Special, offered. The width of a Junior but almost as long as the Senior, it sported either the imprint Special or JL (Junior Long). A 1926 Permanite Big Red with a single cap band and medium imprint. Pencil in red or black. n 1924 the imprint was changed and became somewhat less prominent. These imprints are referred to by collectors as the Medium Imprint. Also, the rubber was now of a somewhat lighter style. This new material led to variations in lenght in the 1924 Duofolds. Also in 1924 a true pencil for the Senior Duofold was produced. It was very large and cashing in on the publics nickname of the Duofold: "Big Red" the Senior pencil came with the additional imprint "Big Bro". and black. The pen that caused all the excitement was the Sheaffer Lifetime lever filler in Green Jade. arker soon realised that plastic was to be the new future material for pens, and quicky managed to sign a contract with the plastic manufacturer DuPont, who provided an orange coloured material that Parker called Permanite. Already in the spring of 1925 the red Duofolds in Permanite were finding their way to the customers pockets. Parker did not, however, advertise the new material on account of Sheaffer having previously secured the rights to the new material with the largest manufacturers. Also, as usual, to allow for the selling out old hard rubber stock. Thus it took until August 1926 for Parker to launch a nationwide advertising campaign, promoting the new pen. The same year, and as a direct answer to the Sheaffer best seller, Parker introduced the Black tipped Jade. It was in all respects a Duofold, but for some reason Parker chose not to imprint it Duofold. It either had only the Lucky Curve logo or plainly said Parker Trade Mark. It was offered in the three Duofold sizes with matching pencils. Also in 1926 the imprint on the Duofold pens was reduced further into what collectors refer to as the Small imprint. It still sported the Lucky Curve banner. he cap band, previously set slightly raised was now levelled with the cap. Another "new" model was the Juniorette, this was actually merely a Duofold Lady with the ring on top replaced with a clip like the Jr.
n 1927 the Green Jade Duofolds officially became part of the Duofold series, now being of a more opaque, deeper green colour with clearer white specks. Also the Blue Marble (Lapis Lazulii) Duofolds were introduced. The first model had the colour referred to as the blue-on-blue and is much rarer (top pen below) than the ordinary white speckled lapis (bottom pen). The famous Mandarin Yellow colour was also introduced. The Mandarin Sr Duofold of 1927 is one of the most popular of all the plastic Parkers. It didn't sell very well and there are five hundred Big Reds for every yellow. Depicted below is a Junior. shorter but still longer than the Junior (app 127 mm long and 14 mm Wide). Unfortunately for latter day collectors the plastic (which contains ground fish scales) are very prone to discolouration and mint pens are extremely hard to find. n 1929, just as the stock market crash occured, the complete line was re-designed as the pens became shorter and tapered in both ends, often referred to as "streamlined" Duofolds. The pencil was also redesigned. The new one followed the design of the pen closer, sporting a black clip screw rather than the gold crown. This also allowed for usage as a desk pen by unscrewing the back in favour of a desk taper. GEO.S.PARKER DUOFOLD MADE IN U.S.A.
GEO.S.PARKER PARKER MADE IN U.S.A.
By 1931 the Vest Pocket line also included the colour Moderne Green and Pearl and in April the colour Burgundy and Black was introduced to the standard Duofolds and Vest pocket. It was clear that the depression was taking it's toll in the pen business and the Duofold was indeed running on fumes but Parker wasn't ready to give in yet. In 1932 came the last colour for the American Duofolds, the Moderne Pearl Green and Black. It was a De Luxe pen with three cap bands but the middle one was wider than the others in an attractive manner. Later in 1932 all the De Luxe pens, the Vest pockets and Lady Duofolds featured this new cap band feature. But the truth was that Parker already had a plan to phase out the Duofolds in favour of the new flag ship, the Vacumatic. n 1933 Parker had stopped the production of Duofolds in the Janesville factory but went to great lengths to reduce old stock. In England and Canada Duofolds was, however, continued to be produced in large numbers well into the 1940's, sometimes in attractive colours not found in the American Duofold line. The Duofold was indeed the singularity that boosted Parker from being a small pen manufacturer among many others, to being one of the lead players in the pen world. It had sold in more than ten million items and had it not been for the stubborness of Mr. Tebbel and the foresight of Mr. Kenneth Parker, the history would have looked quite different. A 1928 Duofold Senior in Lapis Lazuuli with double cap bands. A 1928 Duofold Junior in Lapis Lazuuli with double cap bands. A 1928 Duofold Senior in Mandarin Yellow with double cap bands. A 1928 Duofold Junior in Mandarin Yellow with double cap bands. A 1930's Streamlined Duofold Senior in Mandarin Yellow. A 1930's Streamlined Duofold Senior in Jade Green. A 1930's Streamlined Duofold Junior De Luxe in Black and Pearl. A 1930's Streamlined Duofold Junior in Burgundy and Black. A 1930's Streamlined Duofold Senior in Moderne Green and Pearl. A great collection of 1930's Duofold Vest Pockets. A collection of 1930's Duofold pencils. The length is measured from top to bottom, excluding cap rings; the width is measured over the cap band; far top/bottom are measured diagonal. Please be advised that the sizes can differ from pen to pen. Images courtesy of Jake Leventhal,	unless otherwise noted.